Chocolate candy is one of the most popular sweets in the world, no wonder it has its own holiday. 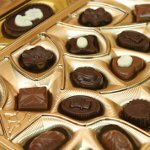 The National Chocolate Candy Day is celebrated annually on December 28. Chocolate candy is a confection covered in chocolate, for example a chocolate truffle or a chocolate bar. Chocolate truffles were first made in France in the late 19th century. Chocolate truffles can be made with a great variety of fillings including chocolate ganache, nuts, caramel, cream, toffee, fudge, nougat, fruits, berries, marshmallow, and even liqueur. A chocolate bar is a form of confectionery packaged in a bar or log form and coated with chocolate. They are usually sized as a snack for one person. A chocolate bar can be solid, but more often chocolate bars contain various fillings such as nuts, caramel, fruit etc. Modern chocolate bars were first produced in the early 20th century. To celebrate the National Chocolate Candy Day, treat yourself to whatever chocolate candy type your like. For instance, you can buy yourself your favorite chocolate bar or a box of caramel-filled chocolates. Delicious chocolate will improve your mood, so don't be afraid to indulge yourself. Just don't go overboard as you can have too much of a good thing.